Hot chocolate kind of day! Iam popping in with a cute snowman card which i made for the Coffee Lovers Blog Hop Fall/Winter. 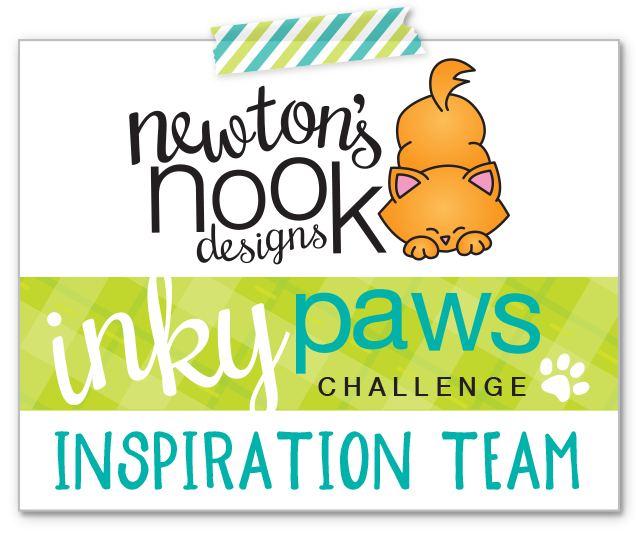 As Newton’s Nook Designs is a Super Sponsor of this event, i wanted to use this adorable little snowman from the NND Frozen Friends stamp set. I stamped and coloured the snowman with the mug using Copics and fussy cut the image. I used a black marker to run around the edges and make any kind of imperfection disappear. Then i due cut the scalloped frame from the Frameworks die set several times: a couple from white cardstock and one from dark red. I layered them on top of each other for a chipboard look. On one of the inner pieces i did some Distress Oxide ink blending using Salty Ocean and Tumbled Glass inks. I added some white paint splatters to imitate snowfall. It is a quick and easy way to add an extra touch to your cards. When it was all dry, i stamped the sentiment from the Cup of Cocoa stamp set. I used the Landscape border dies to cut a snowy hill from white glitter cardstock and assembled the little scene on a piece of patterned paper from the Doodlebug Milk and Cookies collection. I gae it a light blue mat and adhered it to a white card base. As a finishing touch i used my clear shimmer pen to add some sparkle to the cap and scarf, some glossy accent to the nose and mug and a black glaze pen on the snowman’s eyes. 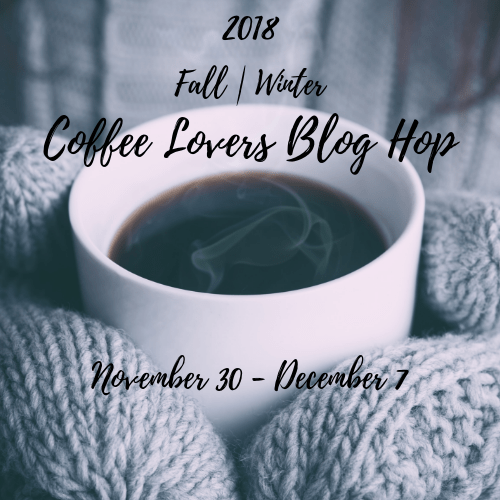 I will link this project up to the Coffee Lovers Fall/Winter Blog Hop. Hope you like my card and will return soon for more inspiration! Iam on the LDRS Creative Blog today with a foxy Christmas card. I love to mix and match stamps and dies from my LDRS Creative stash to create a totally new look and use stamps for other occasions than what they were designed for. These foxes from the Arctic Snowfall stamp set were begging me to colour them for a while now. I just could not resist any longer, i used my alcohol markers to add colour to them. Then i fussy cut them out with my scissors, and used a black marker on the edges to make any imperfection disappear. To set the scene for my fox family, i die cut the rectangle from the Eyelet Lace Rectangle die set from a patterned paper (Arctic Snowfall paper pad) and also from white glitter paper. I used the stitched slope die from the Snowy Day border die set to cut the snowy slopes. I cut another patterned paper from the same collection to cover an A2 sized card front and stamped the sentiment from the Love in blooms stamps set using Mrs Periwinkle Hybrid Ink. I love how well it coordinates with the patterned paper i used in the background! The other half of the sentiment is a die cut Christmas: i cut it from dark grey cardstock and from glitter cardstock which i layered on top of the grey one a bit offset. I assembled the card and adhered the foxes in place using a thin 3D foam tape. I used a black glaze pen and a white gel pen on the noses and eyes as a finishing touch. I hope you got inspired to stretch your stamps and make holiday cards with them. Until next time, happy crafting! I am on the Pink and Main Blog today with a fun Christmas card perfect for coffee lovers! As Pink and Main is one of the Super Sponsors of the Coffee Lovers Blog Hop, I wanted to use the coffee theme for my post today. I started with stamping and colouring one of the coffee mugs from the Christmas Mugs stamp set along with the candy canes. I used alcohol markers and I die cut the images with the coordinating dies. I also die cut a green glitter cardstock wreath using the Wreath base die, it looks gorgeous with all the sparkle! I used the same die to cut another wreath from heavy weight vellum to mute the background a bit behind the coffee mug. I chose a pretty and colourful snowflake patterned paper from the Jolly paper pad, trimmed it a but smaller than an A2 sized card front and adhered it to a dark red card base. I stamped a sentiment in black on the bottom and adhered the wreath with the vellum in the middle. I added the mug in the middle using liquid glue and popped up the candy canes with 3D foam squares. Then I added a bit of sparkle with a clear shimmer pen and used glossy accents on some parts of the images. I love the shiny raised look! I will upload this card to the Coffee Lovers Blog Hop Fall/Winter and to the Simon Says Stamp Wednesday Challenge Anything goes. I hope you got inspired to participate in the Blog Hop and to make some coffee themed cards for the holidays. Until next time, happy crafting! I am so excited for today’s post as it is part of Mona Toth’s Lawn Fawn Holdiay Card Series. She is a wonderful cardmaker with super talent and a great heart! 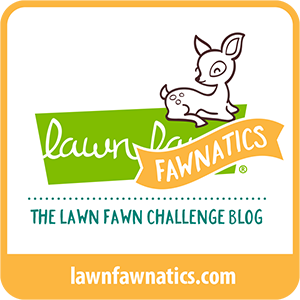 Check out her blog, Instagram and you tube channel every day for a new Lawn Fawn Tutorial this week, she is amazing. For my card today I chose Lawn Fawn Winter skies stamp set from the newest release. I stamped and coloured the polar bears along with some pine trees and used the coordinating dies to cut them out. To set the scene I created a purple night sky on Bristol Smooth cardstock usink Distress inks: Milled Lavender, Dusty Concord and Black Soot. I added water sprinkles to it and also splattered it with a white acrylic paint for the snowy look. When it was all dry, I white heat embossed the sentiment on the top. I die cut some stitched hillside borders from white glitter cardstock and layered it over the distressed background. Then I added all the scene elements with liquid glue. I also added a die cut Merry Christmas sentiment (Merry Christmas Line border die), and framed the card with a doubled up Reverse Stitched Scallop Rectangle window. As a finishing touch I added clear shimmer to the scarf and emphasized the noses with a black glaze pen. I also scattered a few snowflakes from Studio Katia. Please make sure to watch Mona’s video tutorial and leave her a comment on her blog to be eligible for the prize: a 50USD voucher to scrapbook.com. I hope you enjoyed today’s inspiration and hope you will pop in tomorrow for more Christmas cards!